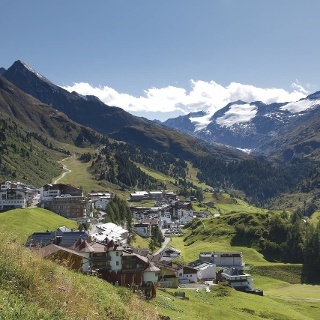 This scenic route takes hikers to Obergurgl in the rear Ötztal Valley. You follow the tracks of stratosphere expert Auguste Piccard and Ötzi - The Iceman. From Obergurgl you also explore the glacier world high above Vent. Glacier trekking at its finest! 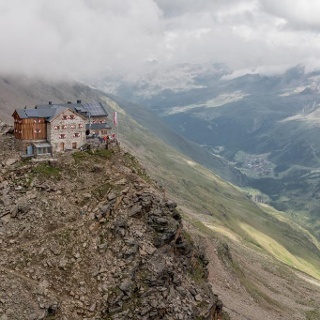 From the center of Obergurgl you walk into the valley to David’s Hütte. There you continue on the themed Stone Pine Trail through the dense forest until you reach the road to Schönwieshütte. The road leads past the hut, winding slightly to the left, and – after a short downhill section – climbs gently through the slopes above Gurgler Tal to Langtalereckhütte. From the mountain hut the path drops down to Langtal, crosses the valley and climbs steeply to the moraine of Gurgler Glacier. Follow the moraine parallel to the glacier to Hochwildehaus. After a rest stop retrace your steps down to approx. 2700 meters above sea level where you descend to the remains of the Gurgler Glacier snout on the left. Cross the glacier at its lowest and flattest point (no trail signs). Once you have crossed the glacier fields there is a steep ledge with metal rungs to help you along. The trail then travels slightly uphill before climbing up to Ramolhaus. Continue to Ramolhaus. The last section of the trail also has steep switchbacks all the way to the top. From Ramolhaus we climb up to the dead ice of Ramolferner Glacier. Continue on the very section up to Ramoljoch by using fixed cables and metal rungs to assist your ascent through boulders, slabs and rubble areas. From here the trail switchbacks down quickly, then runs along the lateral moraine of Spiegelferner Glacier. Continue until you get to a trail junction at approx. 2800 meters above sea level. There turn left towards Martin-Busch-Hütte following Diemweg Trail. The trail then climbs moderately to a saddle and continues through gentle pasturelands and the slopes above Niedertal to Diembach Brook and down to the valley. 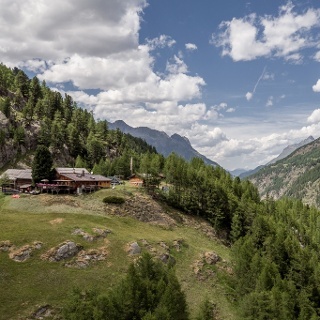 Hike into the valley for a few meters, cross Niedertalbach Brook and follow the moderately ascending cart road to Martin-Busch-Hütte. 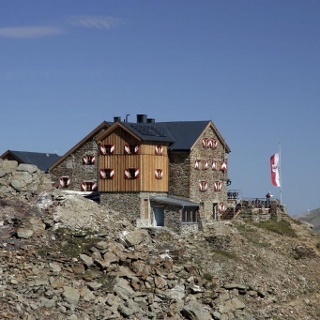 Similaunhütte, a privately-owned refuge, is located at 3017 meters above sea level on the South Tyrolean side of Niederjoch, a mountain pass between Tirol’s Ötztal and South Tyrol’s Schnalstal. Similaunhütte and Similaun owe their fame to Ötzi The Iceman who was discovered at nearby Tisenjoch Saddle (about 1.25 hrs walk). 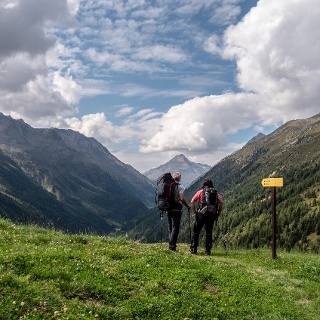 This scenic tour to Similaunhütte leads into Niedertal Valley along Niederjochbach Brook. The trail then climbs gently through glacier moraines. From Seibach Brook you stay on the moraine ridge all the way to Bild area. Afterwards the route continues without much elevation change to the glacier. Usually hikers had to cross Niederjochferner, but since 2008 there is a new trail circumventing it. The last section of this trail is rather steep. This blazed trail leads west of Niederjochferner to Similaunhütte. 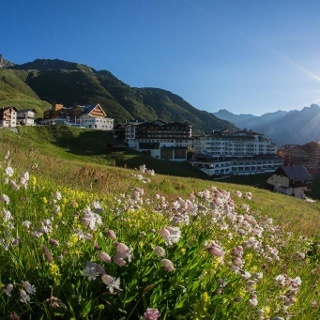 Im Zentrum von Obergurgl halten wir uns taleinwärts und folgen ab Zirben Alm dem alpinen Erlebnisweg durch den Zirbenwald. 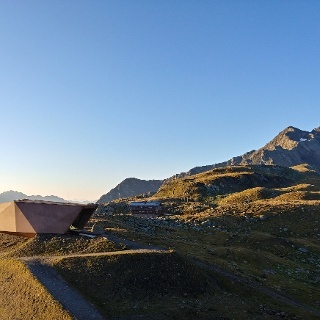 Die Route mündet in den Fahrweg zur Schönwieshütte, der einen Linksbogen legt und über dem Gurgler Tal ansteigend zur Langtalereckhütte führt. Anschließend folgen wir der Beschilderung Richtung Piccard Hängebrücke. Auf ca. 2.600 m steigt man über Gletscherschliffplatten hinunter zur Hängebrücke, welche über die Reste der Gletscherzunge des Gurgler Ferner führt. Weiter folgt man den Weg bis hinauf zum Ramolhaus am Köpfle. Im letzten Abschnitt führt der Steig in steilem Gelände nach oben. Wir wandern vom Ramolhaus über das Toteis des Ramolferner. Es folgt die Passage in steilem Gelände zum Ramoljoch. Fixseile und Stahlbügel erleichtern den Aufstieg über Blockwerk, Platten und Geröll. Jenseits in Serpentinen hinab und dann – zunächst neben dem Spiegelferner – meist relativ flachabwärts. Auf der Seitenmoräne des Spiegelferner zweigt man in etwas mehrals 2.800 m links zur Martin-Busch-Hütte ab, hier beginnt der Diemweg. Es folgt ein leichter Anstieg, wo wir ins Almgelände eintauchen. Anschließend werden ohne nennenswerte Höhenänderung die Hänge über dem Niedertal gequert. Wir überqueren den Diembach, dann leitet der Steig oft in Serpentinen Richtung Talboden hinunter zur Martin-Busch-Hütte.